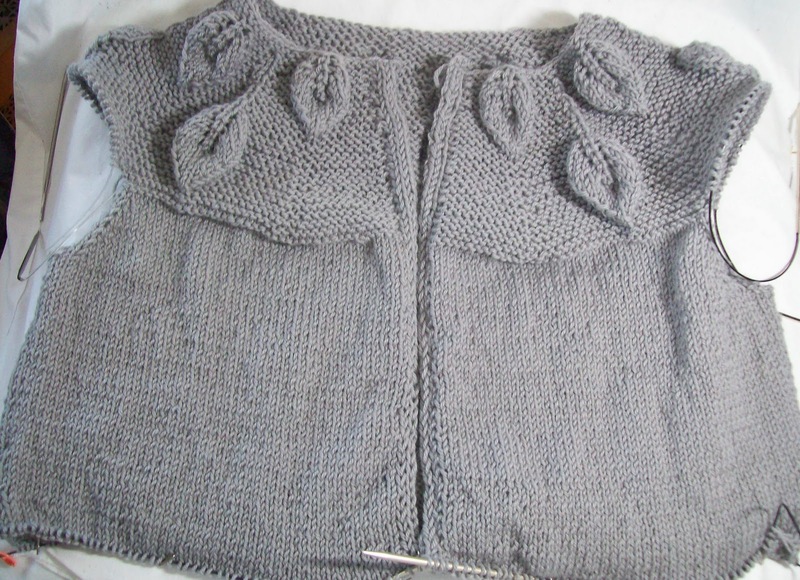 Now the length of the vest (center back) is 16.75, --at the under arm, 8.25 inches. I also added the slightest of waist shaping (just 4 decrease on each side). It's hardly noticeable—but its something. I might add a casing later (as a finishing touch)--or maybe I'll think of something else..
At this point, its just about waist length--which makes perfect sense--My neck to waist measurement is 18 inches, and this sweater vest started with a slightly lower neck line--so almost 17 inches at the center back is "right". In a few more rows, I will restore the 8 stitches I decreased (and maybe even 4 more!) to flare the hem of the sweater out. While I have decided I want ribbing for the collar, I am pretty sure I don't want ribbing for the lower edge—I think a hem is the way to go . This is a PITA way to finish off over 200 stitches, because I like to graft the hem to the knitting for a smooth seam—but I think it will be worth the work. I haven't touched the sock at all.. Likely these January socks will be a bit late—just as December's socks were late—On the other hand, I have knit 1 secret pair of socks already this month—so its not as if I am being a total slacker!